Join us for the experience of a lifetime…share intimate space with Dolphins as they join Your Therapist Team during your therapeutic treatments in the water. See Therapy in the Water with Dolphins to find out what it is like to be treated in the water with Dolphins. 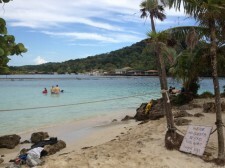 This all happens in the spectacular setting of Anthony’s Key Resort in Roatan, Honduras at the Roatan Institute of Marine Sciences. In addition to the extraordinary Dolphin activities that you will experience, this package also includes Five Star Accommodations, horseback riding on the beach, the resort’s snorkel package and unlimited use of Kayaks. See Program Descriptions to discover the details of the inclusions in the retreat package. During the eight days, you will be engrossed in much Dolphin activity each day; however, there should be ample time in the afternoon of several days for you to bask in the sun, kayak, snorkel, ride horses, or even dive. Therapy in the Water with Dolphins. You will experience four individual treatments on separate days and Your Therapist Team will include two or more skilled manual therapists and one or more enthusiastic Dolphins. Therapy treatments on either massage tables or in the water. You will have a therapy treatment on a massage table in the Dolphin areas, or in the water close to the Dolphin areas with two or more skilled manual therapists. This is important support work for your sessions with the Dolphins. Special time with Dolphins and Trainers. This is a unique “behind the scenes” opportunity to spend time with the trainers and Dolphins as they feed, train and interact with the Dolphins on a daily basis. Dolphin Encounters. You will begin this thrilling activity by being introduced to a friendly and loving Dolphin as you stand waist deep in the water with a few other people and a skilled Dolphin trainer. You will get to touch, kiss and play with your new friend and the trainer will describe many characteristics, anatomy and behaviors. It is a great photo opportunity for you…and if you miss your own camera…no problem…a professional photographer will be capturing those moments. Dolphin Snorkel/Swim. This is an awesome time…following the Encounter, you have the opportunity to participate in an unstructured 30 minute Dolphin interaction. You can snorkel in an area with up to 12 different Dolphins who are free to interact with you as they choose. Dolphin Education with Dolphin Performances. This will probably be on your first day of Dolphin activity in the Roatan Institute of Marine Sciences area. A most interesting “talk” will be presented that provides an introduction to cetaceans (Dolphins are a member)…their anatomy, physiology, behaviors, communication, conservation issues…and much more. A couple of Dolphins will come over from their sanctuary on Bailey’ Key and show off a few of their many talents. Following this Dolphin introduction, my colleague, Susan Steiner, and I will give you an orientation of the upcoming program events and what to expect. Group Discussions. At the beginning of each day, we will spend some special time with our group to share experiences and discuss any issues that may arise.